They are incredibly beautiful and you caught it. You caught the happiness. Great shot! Best smiles to don a Nike cap. Beautiful! super nice photo! great smiles, great colors, nice cascading mountains in back!!!! LOVE the sunlight in Tibet on all your photos!!!! 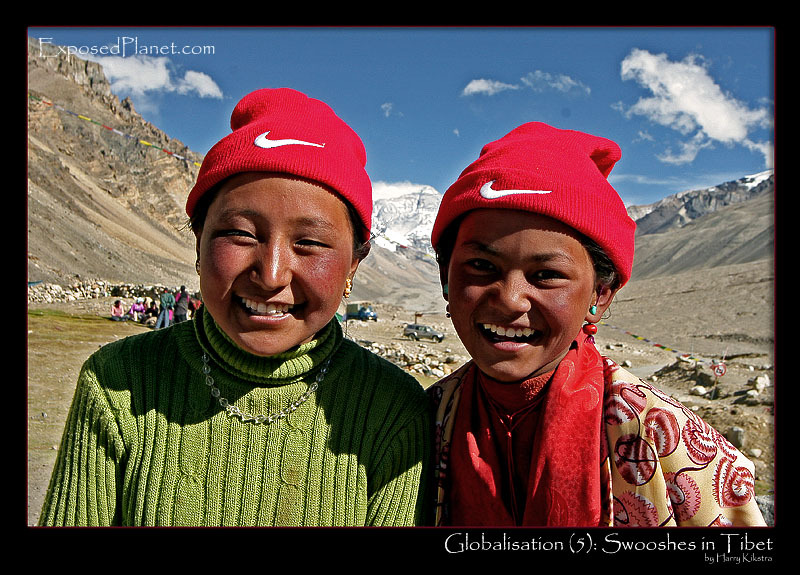 The story behind "Globalisation (5): Swoosh in Tibet, young girls with Nike hats"
Another example of the influence of Nike and other global brands on culture. In the back you can see Mount Everest, this is shot at the Rongbuk Monastery where a large crowd gathered for an open air market. These two young girls were very happy when I took their picture..
Another example of the influence of Nike and other global brands on culture.In the back you can see Mount Everest, this is shot at the Rongbuk Monastery where a large crowd gathered for an open air market. These two young girls were very happy when I took their picture..